High school is the final stage of basic education, and coincides with the effervescence of adolescence. Therefore it is important to prioritize cognitive development as well as the work with conceptual content. The focus on studies intensifies and the relationship with themselves and the world becomes more complex. Beit Yaacov School aims for the betterment of young people by means of the consolidation of the Jewish identity, development of critical thinking and the consolidation of an international mindset. Upon this school stage, the syllabus contains more subjects, and students are on a journey towards university and a phase of decisions, admission examinations (vestibular – university admission examination and ENEM – High School National Examination) are closer, individual responsibilities increase and so do the demands of the world. Students have to be prepared for this new scenario and school holds a key role in this journey. 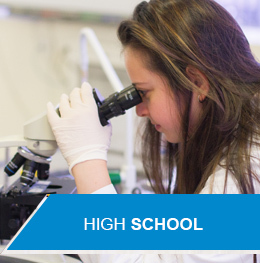 High School at Beit Yaacov promotes the wholesome development of its students. Schedule includes the Jewish Unit as well as classic subjects, which allows for a solid training for students. As of the 1st year, the Diploma Programme – IB is part of this scenario, counting on a technological park, well-trained and up to date teachers with experience overseas. The evaluation process relies on written tests, homework, teachers observe students in class and make adjustments in lesson plans as they go.